Providing the couple with their Couple's Report. The review of their report one-on-one with our trained PREPARE Facilitator via Skype (up to one hour). Providing the couple's parish with a copy of the Facilitator's Report along with a summary from our Facilitator explaining the report and the outcome of the Skype review. Register on this website and purchase Prepare/Enrich. Prepare-Enrich is a third party provider of the Prepare-Enrich marital inventory. Within 24 hours (weekends excepted), you will be emailed a 12-character Login Code from our provider's website, www.prepare-enrich.com. This 12-character login code is separate from your registration login for this website. Once you receive your code you will be able to access the inventory form through the links provided in the email or the Prepare-Enrich website, www.prepare-enrich.com. 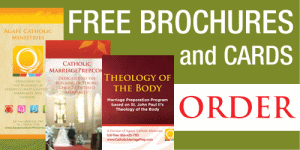 CatholicMarriagePrep.com will receive notification upon completion of your inventory and will email you a link to your personalized Couple's Report on the following business day. The couple's parish is provided with a copy of the Facilitator Report. The couple reviews their report one-on-one with our trained PREPARE Facilitator via Skype (up to one hour). Providing the couple with their Couple's Report and a list of exercises/worksheets related to their "areas for growth" as indicated by their report. Providing the couple's parish with a copy of the Facilitator Report. For over thirty years, PREPARE/ENRICH has led the way in helping couples explore and strengthen their relationships. The main component of the program is an online survey you each complete in about 30-45 minutes. PREPARE/ENRICH is not just any survey. The items you respond to are based on research and are intended to help you identify the unique strengths and potential growth areas of your premarital relationship. You'll be in contact with a facilitator trained to provide feedback by helping you understand your results and learn important relationship skills. Built on a solid research foundation, PREPARE/ENRICH has been improved and refined over the years to become one of the best, most effective, easy-to-use relationship assessment tools available.